It’s practically a daily occurrence, the establishment news media reporting Republicans are in trouble with the voters because of something President Donald Trump did, said or tweeted -- as if next year’s elections were to take place tomorrow and the GOP isn’t fielding any worthwhile candidates. But what about the Democrats? Are they sitting pretty heading into the next round of all-too-important ballots? Not necessarily. It turns out members of the minority party are worried – and it’s primarily about the Russians interfering in close races. Kyle Cheney, Elana Schor and Cory Bennett of Politico reported, “Democratic senators fighting to hold on to their seats next year are increasingly worried about a troubling reality: Russia appears set to mess with U.S. elections — again. One wonders if they’d be equally distraught if it were the Republicans defending so many seats. 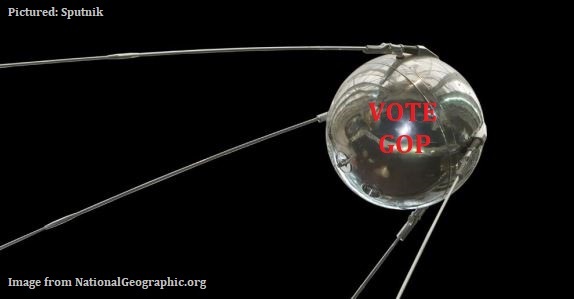 The Politico writers specifically referenced Senators Bob Casey (PA), Heidi Heitkamp (ND) and Jon Tester (MT) as being especially uneasy about the possibility of Ruskies intervening on behalf of the Republicans; perhaps they’re wary of a modern day Sputnik landing in everyone’s backyard with a GOP sample ballot attached. By the tenor of the Democrats’ gripes it seems they want to expand the current Trump/Russian collusion investigation to cover future foreign nose-sticking into their own personal political business. Do the Russians really have nothing better to do than devote manpower to try and fix political races in North Dakota and Montana? And even if they don’t, do the Democrats truly surmise the Russians would prefer new Republican senators to a bunch of obstructionists to the Trump agenda? Meanwhile, some Republicans also acknowledge the possibility of Russian covert political operations though they’re not exactly saying which side they believe would benefit from it. Is there a cover-up here? Should there be another special prosecutor appointed to investigate whether foreign agents are cooking public opinion in favor of one party or the other? I gotta admit, this whole episode makes me chuckle. Here it is nearly nine months into the presidency of a man no one (at least not in establishment circles) said could win and the clueless opposition party isn’t the least bit frantic about their own set of issue deficiencies; instead they’re flustered over the possibility the Russians might say something bad about one of them that would turn a voter’s opinion in favor of Trump and the evil Republicans. Or perhaps they’re frightened the Russians might have some legitimate dirt on them that, if revealed, could be embarrassing. It seems like six of one, half dozen of the other here. Democrats are desperately grasping for something to distract Americans’ focus away from their legislative positions in order to make it look like when they lose elections that someone or something other than them is to blame. Correct me if I’m wrong, but wasn’t it the Democrats who swore up and down in the lead-up to last year’s presidential election that the result would be legitimate and the process is tamper-proof? Wasn’t it the liberals who were shocked and appalled when Trump indicated he might not accept the election result as legitimate? Democrat impressions quickly changed when they ended up losing and it didn’t take long for them to turn their gazes towards the east to the heart of the old Soviet Union to try and concoct a rationale to cover their own inadequacies. When will they concede that they had an awful candidate without an agenda following on the heels of an extra-constitutional Democrat president who led an all-out assault on the institutions many Americans hold dear? Let’s also not forget that these same Democrats are now criticizing and stonewalling Republican and conservative efforts to ensure election integrity through voter ID laws and requirements for states to cleanse their voter registration lists. If Democrats are alarmed that Russian ads or data breaches might make them look bad then why aren’t they going along with a complete examination of the entire system? The 2016 election was about substance, not tampering. Donald Trump put his own unique spin on the campaign but it was the issues he championed – not solely the candidate – who got people energized and brought home the win. America’s center-right population was sick to death of having politicians like Obama, Harry Reid and Nancy Pelosi apologize for the country’s exceptionalism while laying fresh asphalt on the big government road to ruin. And the Democrats aren’t just queasy over the Russians either. The California Democrat old guard is under assault from within the party, too. It appears ancient dinosaurs like five-term Senator Dianne Feinstein isn’t liberal enough for the state’s restless leftist base. Carla Marinucci of Politico reported, “The state Democratic Party, until recently, has been caught in the throes of a bitter dispute over the chairmanship, pitting party veterans against the activist ‘Berniecrat’ wing. There are calls for Nancy Pelosi to step down as House Democratic leader. And Dianne Feinstein is now the target of progressives determined to prevent her from winning a fifth Senate term. Yes indeed. With all the recent fury over sleazebag serial-woman-abusing Obama/Clinton-lover Harvey Weinstein there’s reason to believe Hollywood’s money spigot may eventually run dry. Now that it’s no longer a movie industry secret that lots of sordid stuff goes on behind the scenes among the higher-ups in the country’s entertainment production capitals (which certainly includes New York) Americans may very well turn off the tube on Hollywood productions in the same manner they’re ditching the flag-denigrating NFL by the millions. If DiFi and Nanny Pelosi aren’t liberal enough for the leftist kooks out in California, who possibly would be? But unlike in the Republican Party where anti-establishment candidates are giving the elites a serious run for their money, Marinucci reports that the Democrat establishment defeated ultra-nutty Bernie-backers in a number of primaries and most of the Golden State’s name-lefties are backing Feinstein (including Kamala Harris, Barbara Boxer and Gavin Newsom). One can’t help but think the Democrats, led by the establishment old guard Obamas and Clintons wouldn’t allow the insurgents to get very far. They’ll be discarded like a faded Obama “Hope and Change” bumper sticker in a trash receptacle. As was amply exposed by the Wikileaks email dump last year (credited to the Russians, of course), the party establishment wasn’t the least bit bothered by fixing the results in favor of the big names. Bernie Sanders never had a chance against the Democrat ruling class – and neither did his hordes of unwashed, unshaven and privileged millennial followers. After all, people like Pelosi and Feinstein still control the money and in Democrat-land that means everything. Pelosi can buy enough votes in the House to retain the support of a large enough coalition to keep her on her perch for as long as the San Franciscan wants to sit there. Likewise a career political hack like Feinstein’s war chest must be so impressive by now that she could easily smother any radical challengers. This is becoming less and less true on the Republican side, however, where Mitch McConnell is facing opposition from not only conservatives but also from his own donor base. David M. Drucker of the Washington Examiner reported, “McConnell's donors are frustrated with the collapse of Senate legislation to repeal Obamacare and unhappy about the outcome of a September special election in Alabama. SLF spent $9 million of their money in that campaign but still failed to push appointed Sen. Luther Strange past fiery culture warrior Roy Moore, a retired judge. Drucker’s article makes it sound like McConnell’s establishment donors are staying onboard but only so long as the ineffective majority leader produces something substantive on cutting taxes. McConnell’s main apologist, Senate Leadership Fund President and CEO Steven Law, talks like there’s a solid cash wall behind McConnell that won’t be smashed no matter what. McConnell may still have his establishment cronies in his corner for a while longer but he has no support among leaders of the conservative grassroots who are calling for his ouster. The truth is grassroots backers of all stripes are becoming increasingly suspicious of the establishment leadership of both parties, ruling class elites who talk a good game and make loads of promises but don’t deliver on anything. It’s so rotten not even blaming the Russians could possibly work.